Deep beneath the ice of Jupiter’s moon Europa, life teems in the depths of dark oceans fed by belching chemical-rich volcanic vents. But more spectacular discoveries of life elsewhere in the cosmos have left Europa little more than another commercial stopover with an orbital station and a decaying space elevator ferrying cargo and personnel to and from the moon. But when one of the massive elevators stops midway with no communication from the crew aboard, a rescue team soon discovers that the stranded elevator is transporting a deadly cargo from another world, a savage organism that threatens life on Europa and, ultimately, life on planet Earth. 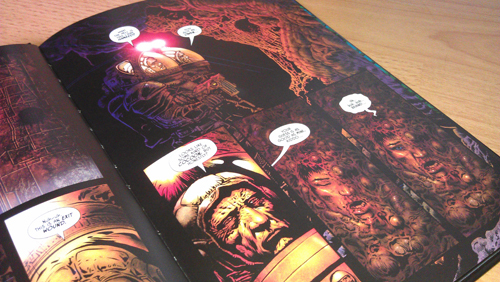 In December 2011 Dark Horse released Aliens – Fast Track to Heaven, the first Aliens story since the Aliens – More Than Human and AvP – Three World War series. Written, drawn and coloured by Liam Sharp, Fast Track to Heaven is the first of two novella Alien stories to have been released by Dark Horse so far. Set aboard a Weyland-Yutani space station in orbit of Jupiter’s moon Europa, this short comic sees us taken deep under the ocean of Europa’s icey surface and on an orbital elevator between the space station (Heaven) and the research facility on the surface (Hell). An Alien is unleashed aboard and we follow the journey of a team of scientists and their Colonel protector as they attempt to escape the walking angel of death that is the Xenomorph. The novella is a short, self contained story and comes as lovely hardback with a beautiful cover done by Liam Sharp. It weighs in at a length of 38 pages. From the moment I saw the Giger-esque style Alien on the cover I got the sense that this would feel like “Alien”. Sharp carries that feeling throughout the book, using Nostromo looking spacesuits, an old beatdown looking space station and Director’s Cut style cocoons to maintain that distinctively looking “Alien” feel. It also gives the impression that this story is set early on within the chronology of the Alien timeline but it is never touched on. Sharp also uses a variety of background colours and tones, often contrasting with the lighting on the characters in the forefront. This keeps the visuals fresh and appropriately setting the mood. I was pretty impressed with Sharp’s artwork. I remember seeing those first preview panels and seeing the cocoon artwork and thinking how fresh it was to have a comic not look like it was set around Aliens. I was so happy to see that aesthetic style carried throughout the book. 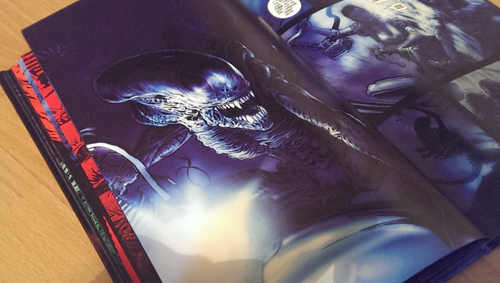 His Alien doesn’t actually look as Giger-esque or as detailed within the actual book itself, sticking to a bit of a generic design but it definitely isn’t the worse interpretation of the Xenomorph I’ve seen. My biggest issue with the Fast Track to Heaven is the extremely short length. I understand this is a graphic novella and that novella is obviously shorter in length but I feel like Liam Sharp wasn’t given the page count to really stretch his legs as a writer. Sharp includes a large number of characters, mostly stereotypical, and without the time to really develop these characters or their personalities, it falls to the stereotypes to fill in the gaps and I found that incredibly dull and uninspiring. The story is largely unimpressive, typical and inessential Aliens adventure – you wouldn’t be missing out on not reading this novella. The characters are nowhere near interesting enough to carry the narrative and the story can’t copy either. The book also comes to an abrupt unsatisfying and inconclusive end. All-in-all it reduces Fast Track to Heaven into a dull story with fantastic visuals. Liam Sharp can definitely draw for the Alien franchise but he either needs more pages or for someone else to tell the story. As I have now reviewed both of Dark Horse’s novellas I’d like to just comment on how disappointed I am. 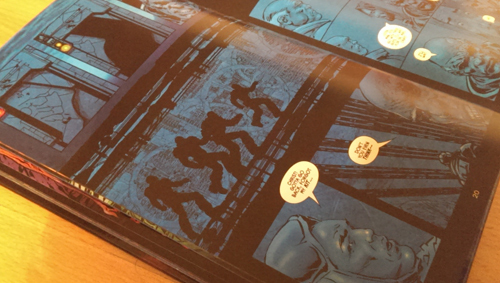 These short comics have just been inconsequential and a waste of my time as a fan and reader of Aliens literature. I really just want to see the return of serialized Aliens comics. 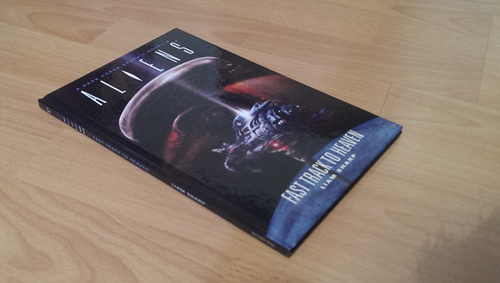 From Corporal Hicks, at AvPGalaxy.net, I give Liam Sharp’s Aliens – Fast Track to Heaven, 2.5 out of 5.